Lasagna is one of my favorite foods. It seems to be on a family birthday meal wish list at least once or twice a year as well. My basic lasagna recipe is a family favorite--but, I can never leave well enough alone. I'm constantly playing with lasagna flavors and ingredients. Mexican lasagna and tofu lasagna frequently emerge from our kitchen. Today I was working with a new lasagna technique--lasagna roll-ups--and decided to combine my spinach and cheese filling from my spinach stuffed shells with a tofu marinara sauce. It was a little time consuming--but, delicious. 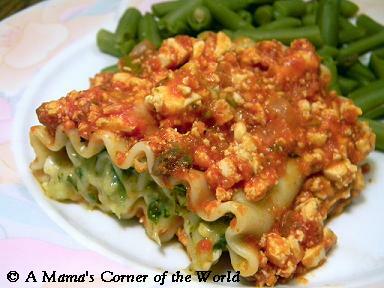 Here is the latest lasagna recipe: Spinach Lasagna Roll-ups with Tofu Marinara Sauce . Prepare the Tofu Marinara Sauce. Press the water from the tofu by placing the tofu square (or half of the square if you are using only 1/2 pound) between multiple layers of paper towels. Place a heavy skillet on the tofu for about 10 minutes to push out as much of the water as possible. After this, I generally change the paper towels to dry ones again and continue to press the tofu by hand. You will be amazed by the amount of water in a block of tofu! In a large sauce pan, preheat the butter and olive oil. Add the peppers, onions, mushrooms, tofu and seasonings to the pan. Cook over medium high heat until the vegetables are tender. Add the Marinara sauce directly to the saucepan. Simmer over low heat for 30-35 minutes to allow the tofu time to take on the flavors of the sauce. While the sauce is simmering--boil and cool the lasagna noodles and prepare the spinach cheese filling. Prepare the spinach and cheese filling. Begin my preheating a large skillet with olive oil and butter until hot. Add the onions and saute for 2-3 minutes. Add the spinach, mushrooms and spices. Saute over medium heat until mushrooms are tender and onions are translucent. Remove from heat to cool. In a medium mixing bowl, combine the cheeses and egg. Mix until thoroughly combined. Add the the cooled spinach mixture to the cheese mixture. Combine well with a fork and set aside. Prepare the Baking Dish and Preheat the Oven. Lightly spray an 11x9 inch rectangular baking dish with olive oil flavored cooking spray. Preheat the oven to 350F. Make the Spinach Lasagna Roll-ups. Place each lasagna noodle flat on a cutting board or clean work surface. Place approximately 1/3 c. of the spinach filling onto each noodle--spreading it evening with a fork down the length of the lasagna noodle--leaving about 1/2 inch of "naked" noodle at one end. Begin with an end that has filling all the way to the end and loosely roll the noodle until the other end is reached. Prepare the Spinach Lasagna Roll-Ups with Tofu Marinara Sauce for baking. Place each roll with the open end down into the prepared baking dish. Spoon Tofu Marinara sauce over each spinach lasagna roll-up. Sprinkle with Parmesan Cheese. Cover the baking dish with aluminum foil. Bake for 30-35 minutes or until sauce is bubbly and the roll-up filling has melted. Serve. Gently lift the individual rolls from the baking dish. Spoon tofu marinara sauce from the baking dish over each lasagna roll-up. Serve with additional Parmesan Cheese, if desired. We love these with salad, green beans and garlic bread. I love spinach and I love lasagna so I think I may need to make this! Enjoying your blog. Following back from Everyday harvest blog hop. I also added you to my blog link list. Thanks!! Lasagna Roll-ups must be the new rage! I posted my recipe not too long ago. Yours sounds fabo, too! I would be pleased if you would join in on my Friday"s Photo File ~ share any photo. Linkup begins tomorrow morning at 1:00 a.m.